Published: Dec. 16, 2012 at 10:30 a.m. 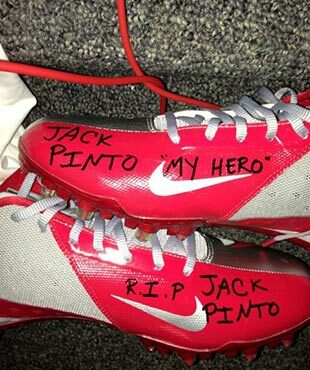 Updated: Dec. 16, 2012 at 04:31 p.m.
Sandy Hook Elementary School student Jack Pinto, a 6-year-old victim of the Newtown, Conn., shooting Friday, was a huge New York Giants fan. His favorite player was Victor Cruz. Cruz learned this news Saturday and reached out to Pinto's family. ESPN's Chris Mortensen reported that Cruz will wear Pinto's name on his cleats and gloves during Sunday's game against the Atlanta Falcons. NFL.com's Kimberly Jones said Cruz also left the conversation with the family believing Jack Pinto will be buried in a Cruz jersey. Giants coach Tom Coughlin spoke with ESPN's Rachel Nichols on Sunday morning and said his players, like so much of the rest of the country, are "very, very much affected" by the Newtown tragedy. Newtown is roughly 60 miles north of New York, and the area mostly is made up of Giants fans. The Giants will wear helmet decals Sunday to honor the victims of the tragedy. A decal or a name on a cleat feels like a small gesture in the face of such horror, but the Giants are like so much of the country. They just want to do something to help on a weekend of unimaginable sadness for families like the Pintos. UPDATE: Cruz wore the cleats and glove during the game, and Nichols reported that the wide receiver plans to drive to Newtown this week to personally deliver the mementos to Pinto's family.